A PAIR OF WHITE VINTAGE STYLE ORNATE PHOTO / PICTURE FRAMES. There are 2 of these frames for photograph or pictures they are free standing and will stand either way vertical or horizontal and both have a white inner mount.. The outer frame size is 10" 1/2 X 8" 1/2 the inner mount size is 6"X 4" the mount of course can be removed to take a larger photograph or picture. They have been in use so I can not claim them to be new but they are in good condition. Ornate Triple Photo Frame. Condition is Used. Dispatched with Royal Mail 2nd Class. Beautiful enamelled Heavy METAL PHOTO FRAME/DECORATIVE VINTAGE PICTURE FRAME suitable for a 6” x 4”picture, with velour black backing. In very good condition. Grey Shabby Chic Photo Picture Frame Vintage Ornate Antique Style New 8" x 10"
Black French Shabby Chic, Vintage, Black Photo Picture Frame Size Large 8" x 10"
Can be displayed portrait or landscape. Can be hang portrait or landscape. Champagne Gold Glitter Sparkle Stripes. ALSO AVAILABLE IN SILVER. Black Shabby Chic Photo Picture Frame Vintage Ornate Antique Style New 5" x 7"
Perfect for framing photographs, pictures, or cross stitches. SMART ANTIQUE OAK WOOD WOODEN FRAME MEDIUM PICTURE PHOTO FRAME 9.5x7.5" 7.5x5.5"
GOOD CONDITION ALTROUGH A FEW SLIGHT MARKS/SCRATCHES IN PLACES. Cream, animal skin look with antique gold edge. Fits photo 1.5" x 1.5". Images are of the actual item. Made circa 1900 in embossed brown leather. It includes 2 photos. 8 x 5.5cm. Glass inserts appear to be hand cut. General wear to surfaces. 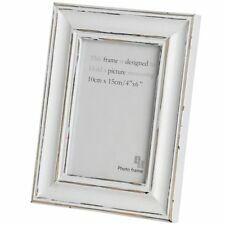 VINTAGE POLISHED WHITE METAL STANDING PICTURE FRAME. MIRROR FRAME. ANTIQUE STYLE, WITH ORNATE SCROLLED DECORATION CAST IN SOLID WHITE METAL WITH HIGHLY POLISHED SURFACE AND BLANK CARTOUCHE AT TOP. FREESTANDING WITH ORIGINAL BLACK COVERED CARD BACK. 36CM HIGH, 22CM WIDE ACROSS LOWER LEGS, WILL TAKE A PICTURE OR MIRROR UP TO 27CM X 17CM. NO DAMAGE OR REPAIRS, PLEASE VIEW PHOTOS FOR FULL DESCRIPTION. Lovely Diamante & Silver Coloured Tiara Ornate Effect Photo Frame 4.25" x 4.25"
Fits Photo 3" x 3". Images are of the actual item. Can be to display photos portrait or landscape. Fits Photo 6" x 4". Images are of the actual item. Colour - White. With your help I will be able to achieve my dream of becoming an interior designer and help with the finishing touches. Can either be placed in the landscape or portrait position. To hold photo 7" x 5". Images are of the actual item. Made circa 1950 in Austria embossed brown leather. The cover is lucite. It includes 3 photos. 8 x 5.5cm. Made circa 1970 of embossed brown leather with a washed silk backing. The cover is lucite. 12 x 9cm folded. Made circa 1940 of brown embossed leather with a washed silk backing. It has a lucite cover.There are 2 letters to give provenance to the photos one was written in 1940 during WW2. Colour - White. Height: 26 cm x Width: 21 cm x Depth: 2 cm. You can put 6" x 4" pictures in here as well by reversing the picture that is in there to give you a white border - or using your own back colour card / paper. Made circa 1970 by Cotswood of embossed brown leather. The cover is lucite. 15.5 x 13cm. Colour: Lace is off white. Black Shabby Chic Photo Picture Frame Vintage Ornate Antique Style New 8" x 10"
Perfect for framing photographs, pictures or cross stitches.